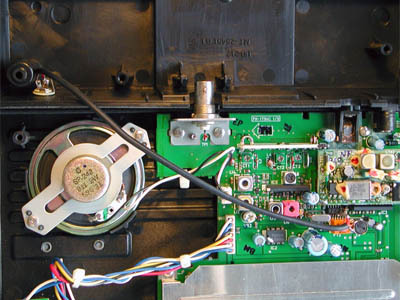 After releasing the 5 screws in the bottom of the scanner, the two parts can be separated. 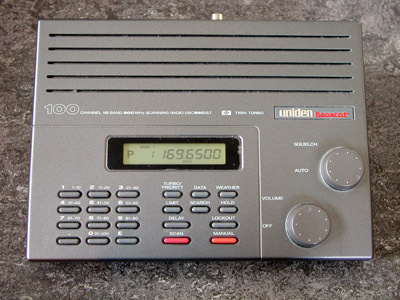 Although the Uniden Bearcat 860XLT looks exactly like the 855XLT from the outside, the interior is different. The discriminator IC is an MC3361. 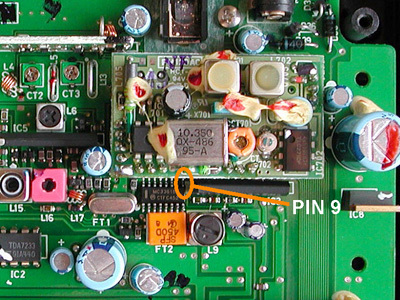 Pin 9 of the IC is hard to reach, as it is located between the IC and the small PCB mounted on the main board. A limiting resistor of 10 k is connected to pin 9 of the MC3361. I have bent to follow pin 9, so that only a minimal amount of solder is needed. The resistor is mounted on top of the IC and fixed with a drop of glue from a glue gun. Because the baseband audio contains an IF component of 455 kHz, a simple RC filter has been created using a 2.2 n capacitor. Together with the resistor this forms a lowpass filter with a cutoff frequency of about 7 kHz. 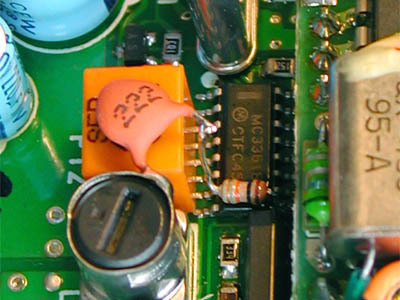 One lead of the capacitor is connected to the resistor. The other lead is connected to the shield of the IF coil (ground). The inner conductor of a piece of shielded cable was soldered to the joint of the resistor and the capacitor. I connected the braid to the metal shield of the IF coil. The other side of the shielded cable has been connected to a 3.5 mm chassis terminal at the back of the scanner.